Thank you Tracy at Fly on Over Eq for hosting yet another wonderful Holiday Blogger Gift Exchange! It's such a fun way to connect with new bloggers and celebrate the Season! The Blog has been a bit quiet as Paul and I made our annual pilgrimage to Ohio to spend Christmas with our families. There was a fun surprise awaiting me at the office today and it must be noted that my gifter took went above and beyond to make sure I had my package before the Holiday- unfortunately we were ships in the night....I literally missed it by one day. 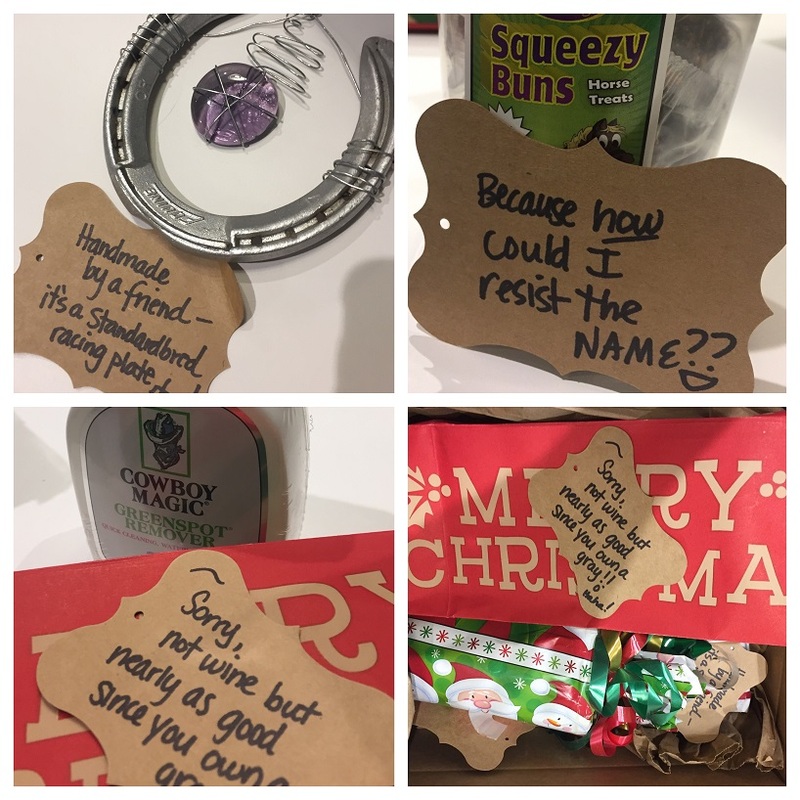 I was treated to a whole bevy of fun presents from Elizabeth at Clover Ledge Farm- each was individually wrapped and adorned in bows with fun tags! The first gift I opened was in a wine bottle bag and while Elizabeth was appropriately apologetic that there was not actually wine in there (clearly she got to know me during this process), she gave me something even better- Green Spot Remover. This stuff is like liquid gold when you have a grey horse and I can run through a bottle lickety split. Ellie scored in the next round with Uncle Jimmy's Squeezy Buns treats! I've never tried these before and I have a feeling Miss Elle is not going to object. I LOVE when I have a tub of fancy treats to give her! Finally a beautiful, handmade suncatcher! Through Tracy, Elizabeth had reached out to find out what my barn colors were and I had shared the standard lineup of navy, hunter green, etc etc.... and then confessed that I sometimes like to dress Ellie in purple....so the choice in stone is more than perfect. If you haven't had a chance to follow along with Clover Ledge, Elizabeth owns two beautiful Standardbred gals- and the suncatcher is built on a Standardbred racing shoe! Because I love nothing more than adorning my desk with ALL THE HORSE THINGS I immediately found the perfect spot where I can enjoy it every day! Thank you, Elizabeth, for the wonderful and thoughtful gifts! You're awesome! Great gifts! As a grey and lots of chrome owner, I love green spot remover too!